Almost a year after the introduction of bots on Telegram – the popular messaging client with more than 100 million active users around the world – some developers have succeeded to exploit this functionality to implement a real strategy game. workers: the workforce of the village. More laborers you have, the faster the crop and the production of bread. In order to hire new workers you must send a special link to your friends on Telegram. bread: the basic product of the harvest, can be sold in exchange for gold. buildings: upgrade your buildings to improve your village defense and bread production. gold: can be used to recruit troops or upgrade buildings. diamonds: purchasable with real money, can be used to buy gold or workers. medals: are obtained by defeating other users, and contribute to the prestige of the village. troops: indispensable to accomplish quests in exchange for gold, to participate in the war to obtain large amounts of gold or to face other Telegram users to gain – guess what? – some more gold, but also prestigious medals. The aim of the game is to climb the world rankings, accumulating as many resources and medals as possible, facing missions, wars and duels. Village Game is still in testing phase, which is quite evident for the presence of some translation errors and for the limited number of missions. Nevertheless, there’s a lot of room for improvement here, and the game is already ranked #1 on the Telegram Bot Store. Also, if you start to play right from the testing version, you will gain some advantage over all users who will register only later, when the final version will be released. 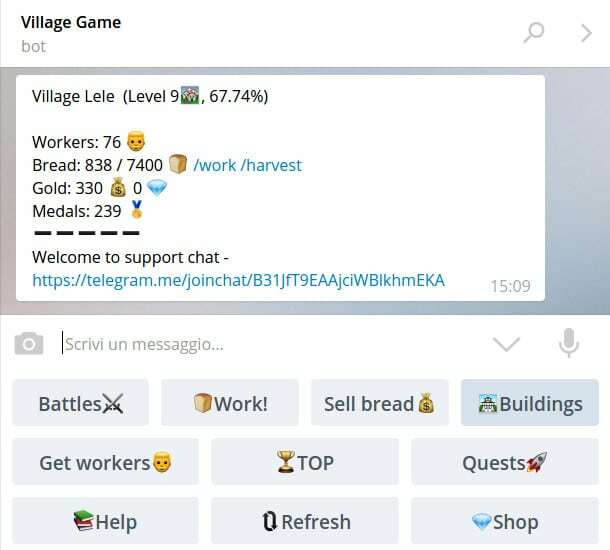 If you want to give a try to Village Game, just search @villagegamebot on your Telegram app, or click on this link. To get some free gold, just send the following codes one by one in the game chat (we’ll update the list as soon as new codes become available). Building added also for other languages. Questionnaires and gifts (/gifts) added. Buildings (/buildings) added for ru and en languages (coming soon also for other languages). Diamonds shop added. You can buy 50 gold for 2 diamonds and 1 worker for 5 diamonds. Temporary Secret Code added: ARAMADANYA (20 gold). Use it fast! Do you have an idea for a cool new feature you’d like to see implemented in the next updates? Leave a comment in the form below: we’ll report the most requested ones directly to the developer!